Now 37, the Australian songwriter has released 9 different albums that all have one thing in common: the spirit involved. Guided by a force that comes from his father’s heritage, Xavier Rudd plays music because “he has been chosen to do so.” An interview - somewhere above the ocean between Bob Marley and a red-tailed black cockatoo. Xavier Rudd is high. Maybe not in the way you may imagine, but the 37-year-old multi-instrumentalist from Australia has always been driven by an external force. In his own words, “I’m guided by something.” This something? The spirit that explains his entire career as a songwriter. When he sits down with his guitar, Xavier just does what the spirit tells him to do. It might sound a bit nutty but that what his 9 albums are made of. 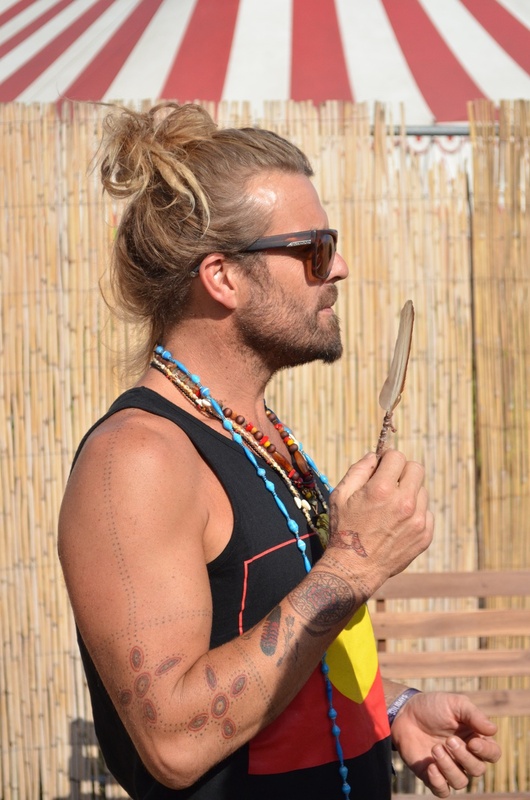 When he walked bare-footed through the press corner of Solidays (the French festival he had been invited to play), Xavier Rudd seems out of place among the stylish journalists. Tanned and toned like a pro-surfer, he wears tiny yellow shorts and a tank top covered by a lot of necklaces. Among them, a massive aborigine feather that Xavier carefully brushed before the interview. Here we go:. What was your first musical awakening? Xavier Rudd: I was sort of born with music. Music had always been around me. My first memory was my father’s records. He had good taste in music. He played Neil Young, Jimi Hendrix, Bob Marley… He was playing it during our surfing trips, in the car and he was singing. I was lucky also to see some good shows when I was little. For example, I remember a concert from Paul Simon’s Graceland tour album to be very special. 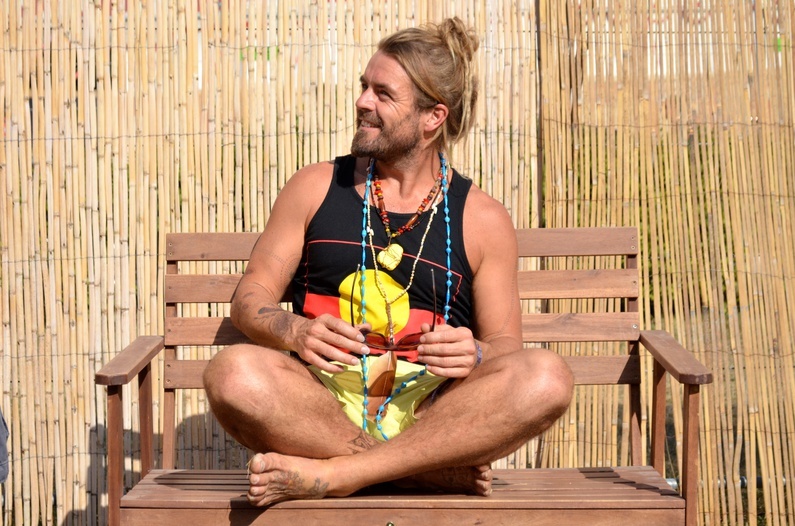 Xavier Rudd: I’ve written songs for as long as I can remember, probably younger than 10. I’ve always sung little melodies about things that were happening around me. I’ve always been singing songs before I really knew that’s what I was doing. That’s still what I do now. So what was happening around you? Xavier Rudd: I grew up in a town near Torquay (ed. a small surfing town south west of Melbourne), in the bush with nobody around. Me and my dog basically. I camped a lot, I slept a lot under the stars, listening to nature, surfing a lot. There was a lot of silence. And singing from the spiritual land. I never went to cities before. When I started touring, it all was very new for me. There were a lot of people. It took me a little while to get used to. Are you a solo person? Xavier Rudd: I’m happy you know. I’m happy to be around the people I love. I’m happy to be on my own too, it doesn’t matter. I don’t like the crowd. Too many people. Xavier Rudd: It is born into me. I’ve a personal heritage on my father side. And in our culture, everything is about dreaming, not like going to sleep and dreaming. Dreaming can be also the spirit that shapes your existence, shapes the land and our connection to the land as a species because we are off the earth and not just on earth. That’s the biggest human misconception I think. Humans have lost touch with that reality that says we’re just the same as that tree (ed. he points out a bush in front of him), we’re connected to the earth, energetically. So we have certain dreams that are part of our nutrients. It’s a big part of our all existence. We can live without that but we wouldn’t live our true paths. So, that knowledge doesn’t come from the ego, it doesn’t come from your own choice, it comes from the old spirit who guides you and if you can’t hear that, if you don’t follow that, then, your life would often be a lot different than it would be if you did. And everybody has that. It doesn’t matter who you are. Xavier Rudd: I don’t know! I have a strong spirit with me. I think it’s an old woman. She’s pretty vocal so when she speaks you have to respect that. (He smiles). And let her tell the story. Xavier Rudd: No. I can see that religion can help people that have lost something but organized religion seems to be the reason why the people are suffering in the first place. Those big groups broke our traditional magic as human beings because we have a magic. We were told way back that was wrong, that all our cultures and our magic, our energy and connection to the land was wrong and that we need to follow one big group and that was the way that people could be dominated. So religion did that to people and for me it’s a bit of a vicious circle. I think we need to understand, to return where we where meant to be as human beings in respect of our environment and land. As creators of the land, we need to break the model of religious conditioning. And we need to have faith in own magic, our own power because we were gifted. You said you have to stay fit, like Bob Marley did through his entire career. What is your lifestyle at home? Xavier Rudd: I’m always outside, ya know. I’m always busy around and around. I live on a river so I’m always up the river. I surf a lot. Doing my thing. I’m active. I run a lot, listening to my heartbeat. And I created a lot of beats around that. Sometimes I run in the rhythm of the song that I’m writing. I’m singing in my head while I’m running. And nobody can disturb me. And you’ve built your own eco-friendly house made of straw and recycled materials. Do you feel bad in another type of environment? You’ve also said “I had to be a warrior before the day”. What does it mean? Xavier Rudd: What I meant was I have to be a warrior in order to hold that old spirit that I’m carrying. It’s important to understand the spirit that’s with me. My music is not always me. Sometimes it’s my emotions and me but quite often it’s spirit who comes from another place. I’ve been chosen to bring that through. If ego is involved, it’s fucked. So I have to be open in body and mind to let that spirit come through. What is the main message in your music? 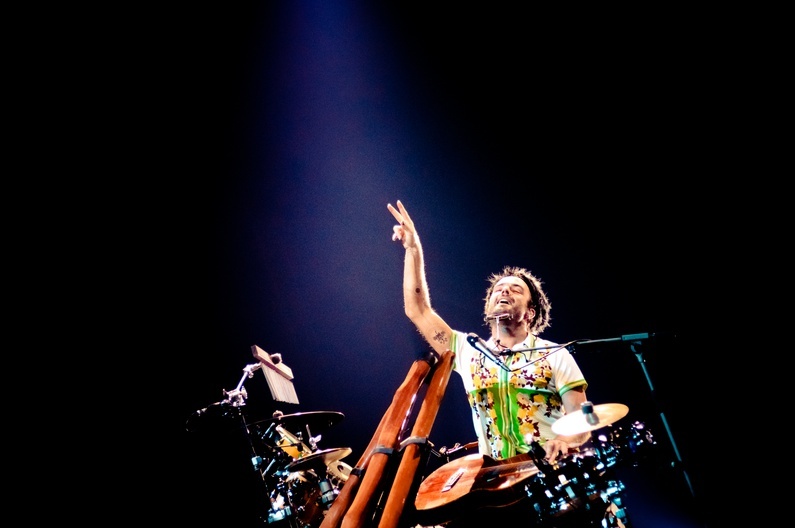 Xavier Rudd: I don’t see it as a message. I do my work. I do what I meant to do, and where that goes is where it meant to go. But if it’s not meant to reach somebody it’s not for me to judge. I just do what the spirit tells me to do. And I can be the judge of who received that. If it’s received positively then I can give thanks. So you’re guided by something? Xavier Rudd: (he smiles) Sort of… He was a red-tailed black cockatoo. It’s an old bird. It’s a very sacred bird in our culture in Australia. And you don’t see them very much. They bring different messages in different times. I was in a desert and there is one bird that doesn’t usually came close – you can only see them from a distance – but it was there. He was speaking to me (ed. he imitates the bird for a while). He was speaking to me and I felt my feet sink into the ground and I couldn’t move. And all those memories and vision of places, faces, times went through my mind. But there weren’t my memories, I had never seen them before. That happens. I left then, and later at night I wrote Spirit Bird straight away. In the sand, on the beach, the whole song was done. And it’s that bird that brought that song.